Steve and Suzy are great people, but you don’t want them meddling in your business all day and night. Especially when you’re looking to relax and unwind in your backyard on a refreshing summer eve. That’s exactly why we’re here. To show you how to create a private backyard oasis on your property. An oasis that your neighbors won’t be able to watch you from. An oasis where you’ll truly be able to unwind and relax through the day and night. If that’s of interest to ya, well, keep on reading. So, how do we create the privacy you’ve always dreamed about in your backyard? How do we keep prying neighbor eyes out of sight? That’s simple. Well, it can be complex. It really depends how you want to do things. This is your oasis, after all. This one is common sense. The easiest way to add privacy is to install mature trees around your backyard. These trees can block the vision of your neighbors and keep things a little more private around your backyard. For a first move, this is one of the easiest ways to increase the privacy of your backyard. At Huston Contracting, we can help you find and install the tallest trees money can buy. And we certainly recommend this in some situations. However, this isn’t an end-all, be-all solution. Other times, you may be better off working with other landscaping solutions to add privacy. A high fence is a key to privacy in the backyard. 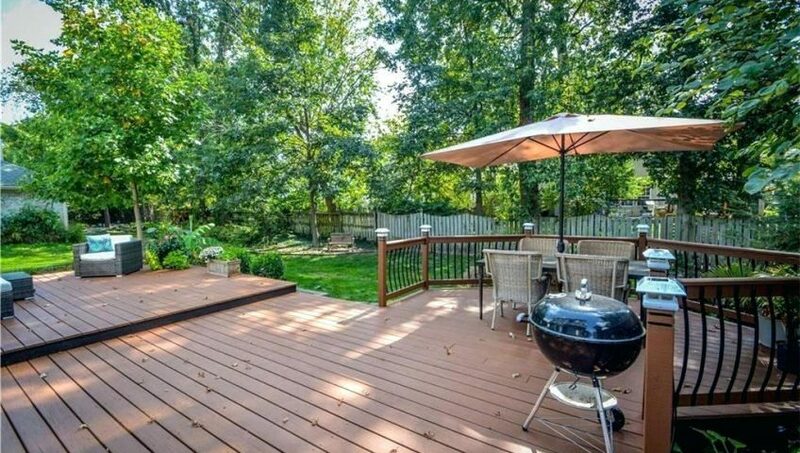 Without a fence, your backyard may feel open and inviting to any and all of your neighbors. Even before installing trees, make sure your fencing is up to par. By installing the highest fence your homeowner’s association will allow, you’ll find privacy all around you. The only issue will be spying neighbor eyes from above. To further your privacy, covered porches can add barriers from the neighbors. These cover and/or screened-in porches will ensures eyes from above cannot see what’s going on in your backyard. This is ideal while enjoying a cold one as the stars come out, but not enjoyable if you’re looking to get some sun while enjoying the backyard. Many don’t know this, but you can build your outdoor kitchen with privacy in mind. As the kitchen is usually tall, the grilling areas and more can all create natural barriers to nosy neighbors. Many of our Olathe landscaping clients have asked us to build extravagant and tall outdoor kitchens with the idea of adding privacy to the outdoor spaces. And of course, we happily obliged. Create the Backyard of Your Dreams – A Private One! These are just a few ideas. While the team here at Huston Contracting believe in being friendly with the neighbors, we understand there’s times when we all need a little privacy to truly enjoy our outdoor spaces. In those times, just get in touch to learn more about your Olathe landscaping options.